It's funny how certain books seem to just have a right time to be read. Often, these are books that you buy with the full intention of reading them immediately, and then for one reason or another, they sit on your shelf unread for years. This is not unusual with gifts – books that look interesting and suit your taste, but that weren't on your mental (or perhaps physical) to-read list, and so get slotted in and then put aside until their time comes. For a book purchased with excitement, though, it seems strange that you wouldn't open it right away. 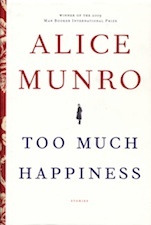 Nonetheless, that's what happened to my copy of Alice Munro's Too Much Happiness. I bought it the Christmas after it came out – soon enough that it's a hardcover, but late enough for it to have a cover line announcing its Man Booker win. I have meant to read it many times since then, but it wasn't until we decided to read it for CanLit Knit that I finally cracked the cover. In classic Munro style, the majority of the stories in the collection are set in southwestern Ontario, and while some are contemporary, many are set ten or twenty or thirty years ago. The collection opens with one of the more contemporary stories. Dimensions is the story of a young woman who, at the beginning of the story, has clearly survived some kind of trauma. She is visiting someone, or trying to, and she has a therapist she has talked to about it. She has cut her hair short and dyed it – very different than the way he liked it, whoever he is – and moved towns. She is quiet and fragile seeming. And slowly, Munro unfolds her story. Doree met Lloyd when she was 16 and he was much older and a nurse looking after her dying mother. They get married, she gets pregnant, and three kids later she's in her early 20s and living in a farm house, largely cut off from other mothers and people her age. Lloyd is controlling, although she doesn't see him that way, and their household swings from fights to uneasy peace. When Doree meets a fellow home-schooling mom, who has a van and can help her with the kids, she allows a tentative friendship to form and one night, after fighting with Lloyd, she goes to Maggie's house to wait it out. He calls, Maggie tells him Doree will stay the night, and in the morning, Maggie drives her home and Lloyd is sitting on the front step. Inside, Doree's children are lying dead. That isn't where the story ends, but it is nonetheless an appalling, devastating, and extremely gutsy way to open a collection of short stories, but Alice Munro isn't one to shy away from difficult subjects. Certainly, not all of her stories are quite so shocking, but each carries a unique kind of one-two punch that hits you with beauty and its opposite. And although each story has a classic kind of twist, the structure never becomes formulaic or routine, because in Munro's hands, each story becomes its own little world, so certain of its details that you wonder how it isn't true. The collection really shines when Munro is telling small stories. My favourite story in the collection was Wood, about a man (which in itself in unusual for Munro) who ears a living restoring and repairing furniture, but who has discovered his passion is going out into the bush to cut and collect firewood. In the choosing of the tree and the process of cutting it down and then chopping the lengths into pieces useful for burning, Roy has transformed a mundane chore into a kind of artistic process. Chopping wood, though, is also an escape from home, where his wife, once feisty and active, has turned quiet and distant. When he feels his hobby and passion is threatened, his anxiety leads him toa kind of hysteria and reckless action, which quickly lands him in trouble, though he manages his way out in the end. Of all the stories in Too Much Happiness, it is the titular story (also the last, and more than twice as long as most of the others) that feels the most out of place. For one, it is set in Europe, in the 1800s, and, while it tells the story of woman at a kind of crossroads, unlike the characters in the other stories, Sophia was a real person. I hadn't yet read the story when we met for CanLit Knit, and although the others said I shouldn't bother, I went ahead and read it anyway (I've been waiting around to read this book too long to not finish it). It is very different, than all the preceding stories, and if you're not expecting it, it would be quite jarring. As it was, Munro hooked me in, and I enjoyed it right up until the end, which was abrupt. It was an interesting experiment, and although I think I prefer Munro when she's inventing her characters and can thus take them where she pleases, I wouldn't avoid her historical fiction in the future, either. To be honest, I'd have a hard time avoiding any Alice Munro in the future, in part because she is prolific and everywhere, but mostly because every time I read one of her stories I can't get it out of my head. She is so good at pulling you into the centre of an emotion – whether joy, sadness, fear, or whatever – that her stories leave the same kind of signature in your mind as events that you experience firsthand. It's astonishing, really, and it makes me wonder how exhausting all this must be for her. At any rate, I hope she doesn't tire of it anytime soon. Alice Hearts Welsh Zombies on tour!